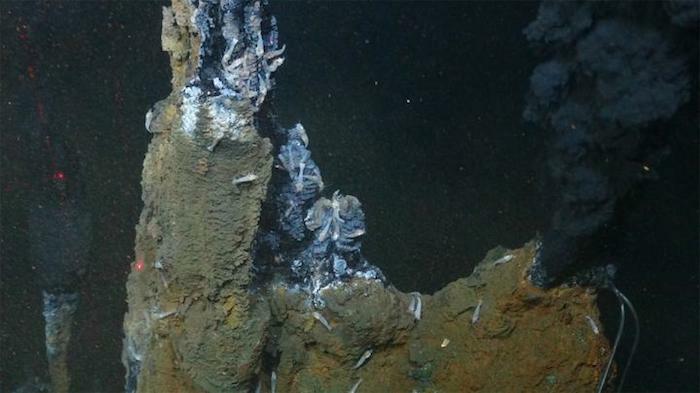 The first discovery of a new type of hydrothermal vent system in a decade helps explain the long observed disconnect between the theoretical rate at which the Earth's crust is cooling at seafloor spreading ridge flanks, and actual observations. It could also help scientists interpret the evidence for past global climates more accurately. This discovery has been made by scientists at the National Oceanography Centre (NOC) and the University of Southampton using a combination of robot-subs and remotely operated vehicles operated by the NOC. Dr Bramley Murton, who co-supervised this research, published in Nature Communications, said "This will really improve our understanding of how the Earth's interior cools. Theory has long predicted that there must be more cooling in certain locations on the Earth's crust than we could account for using the known mechanisms....and this new class of hydrothermal vent system may account for that difference." What makes these hydrothermal vent systems different is that the source of heat driving them comes from hot rock pushed towards the seabed by low angle faults, called tectonic spreading centres, rather than volcanic heat from magma chambers. Dr Murton has been involved in research that discovered tectonic seafloor spreading centres at a number of sites across the ocean floor. "We expect this new type of vent system can be found in tectonic seafloor spreading sites across the globe. However, since they are almost invisible to the traditional ways of searching for hydrothermal vents, and the process driving them was not understood, they remained unaccounted for in scientific models of how heat and chemistry is transferred from inside the Earth's crust. "Our discovery was only made possible using the world-leading marine technology at the NOC" continued Dr Murton, who supervised this research by Matthew Hodgkinson, a PhD student from the University of Southampton. This new class of venting was discovered at the Von Damm Vent Field in the Caribbean during an expedition on board the NOC maintained Royal Research Ship, James Cook. The team used sonar on the autonomous-sub, Autosub6000, to map the vent field before sending down a remotely operated vehicle (ROV) to collect samples of hydrothermal fluids and minerals. Multi-beam sonar on this ROV was also used to produce a map with a resolution so high it could pick out individual pebbles on the sea floor. The investigation revealed that minerals and chemistry at the Von Damm Vent site are very different to those from any other known vents. As a result of the unusual chemistry of the vent fluids, the fifty metre tall mounds and chimneys are formed largely of a magnesium-rich mineral, talc, rather than the more usual iron and copper sulphides. In addition, the vents release over a one thousand kilograms per second of fluid at 215 C, which carries hundreds of megawatts of heat out of the crust. Accounting for such a major flux of heat and chemicals from this new class of vent system has important implications for the balance of magnesium and calcium in seawater, which plays a significant role in past climatic conditions. This research will mean that ocean models of magnesium and calcium budgets will need to be updated and could lead to more accurate insights into Earth's past climate.